What have you done during your sojourn on Earth? Today is International Holocaust Remembrance Day, January 27. It’s the 74th anniversary of the day that the Auschwitz-Birkenau camp was liberated, where more than 1.1 million persons, including some of my friends’ parents and grandparents, aunts and uncles, brothers and sisters were murdered, while the world went about its business. 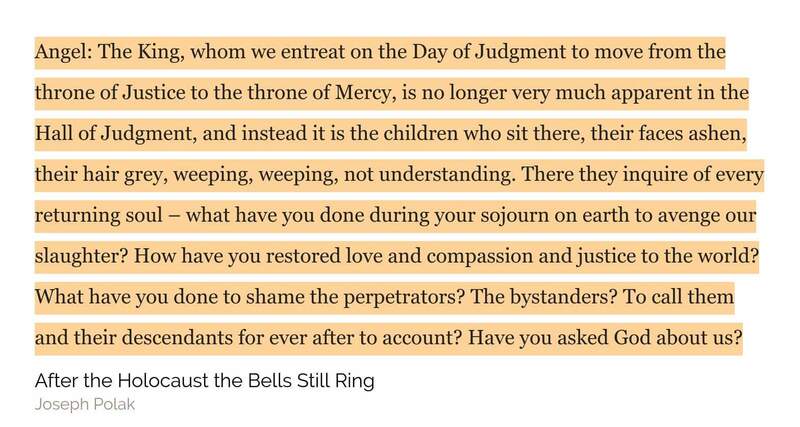 A million and a half of those murdered were children, and it’s a reason this quote hits me hard. It was written by a child survivor of Bergen Belsen, in fact a survivor also of one of the three transports that left Belsen. All three transports were headed to Theresienstadt Ghetto in Czechoslovakia; the first transport actually made it there. My book focuses on the second transport that was liberated by the Americans. Joseph Polak, now a Boston University professor and rabbi, was on the third transport, liberated by the Red Army 10 days after that. I liked the book [After the Holocaust the Bells Still Ring, Urim Publications, 2015] on many levels, but I guess that some of the ‘imaginary’ conversations he carries on, struggling to come to grips with ‘what happened’ and the fact that it never really is ‘over’, and that there are many things that need to be discussed with God, appealed to my sense of my own purpose on this earth. ‘Struggling to come to grips’ I don’t think is the right phrase though, it’s more of an eternal processing, or those attempts, and maybe that is the best link I can come up for now. Anyway, I leave you with the quote and the book link here. An excellent intro is by his good friend, master teacher Elie Weisel. Angel: The King, whom we entreat on the Day of Judgment to move from the throne of Justice to the throne of Mercy, is no longer very much apparent in the Hall of Judgment, and instead it is the children who sit there, their faces ashen, their hair grey, weeping, weeping, not understanding. There they inquire of every returning soul – what have you done during your sojourn on earth to avenge our slaughter? How have you restored love and compassion and justice to the world? What have you done to shame the perpetrators? The bystanders? To call them and their descendants for ever after to account? Have you asked God about us?